This WiFi-only tablet has a 7-inch display, dual-core processor, 512 MB of memory, 4 GB of internal storage and comes loaded with Android 4.2 Jelly Bean. Yesterday, FreedomPop celebrated its second birthday and one year since they started offering free talk, text, and data. To do this properly, they announced their first own branded devices, all with prices below $100 USD. 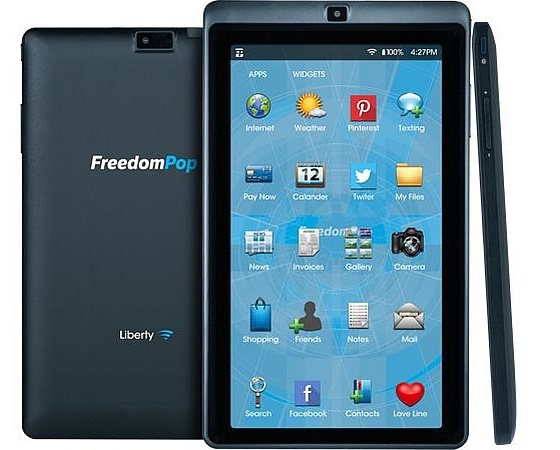 While the FreedomPop Frenzy phablet and one LTE Android smartphone will arrive in the coming months, the FreedomPop Liberty tablet is already shipping. This tablet will be followed next month by the 4G LTE-capable FreedomPop Frenzy, a new Android phablet that will retail for only $99 USD. In addition to these products that carry the FreedomPop brand, the company will soon cut the prices of the Samsung Galaxy Note 2 and Note 3 by 50 percent.